These are an entry level set of wheels that are aimed at commuting and training. 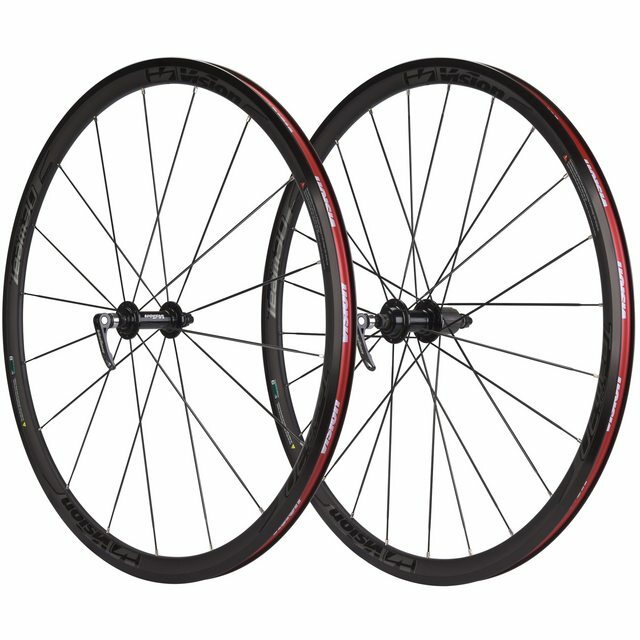 They have a slightly deeper profile than most other wheels in this price range (below €200) which, along with the bladed spokes make them more aero than your average budget wheel (on paper at least). Also, at least in black, they look great. To get straight to the point, what do I think about them? To be fair, apart froma couple of things, I quite like them. They roll well, I definitely think I go a little faster on them and they have taken at least one big hit and are perfectly true still. What do I not like them? Two things, on relatively minor and one, well, not so minor. First, they are hard to mount tyres on. I use them with 23mm Vittoria Rubino Pro. Without a floor pump, I simply cannot get the tyres to sit cleanly on the rim - the bead will just not sit properly in the rim bed. Pump them up swiftly with a track pump and at about 95-100psi you hear the bangs as the bead jumps into place and everyone is happy. This means that road side repairs will never be properly done. You will be vibrating slightly all the way home, or to the nearest bike shop to borrow their pump. A CO2 inflator would probably work, but I do not carry them as I think they are silly. That is a pretty small problem though - far worse is the freehub. Basically, after 3 months it was dead with the pawls no longer engaging. This left me walking home and very grumpy. I know these are entry level wheels, but that is just simply not good enough. When I get home (late) I dismantled the rear hub to clean the pawls, however the freehub is a sealed unit with no access to the pawls - the only option was to replace the whole freehub. In addition, the drive-side bearings were badly discoloured and both the cup and cone decidedly rough. To be generous they were not in great condition, but more honestly they were ruined. So what is one to do? After 3 months, there was no problem sending the wheel back to Probike. They arranged for FedEx to collect it and I sent it back tor them. Once I got the wheel back I inspected it to see what they had done. They had rebuilt the wheel around a hun from the next wheel up in the range, so I have now effectively got a Team 30 clincher instead of a Team 30 Comp. It has cartridge bearings and rolls noticably more smoothly than before. I am really happy with the way Probike handled my case. I dropped into my LBS and asked if he had a replacement freehub that I could buy to get going quickly while the broken one was RMA'd. As a thank you I got an earful about how online retailers do no waste time behind a counter. Well they did spend a lot of time with me. We had a substantial email conversation and they had to research the necessary replacement parts with Vision. They never quibbled, and were initially happy to simply send me a replacement freehub, although the correct model turned out to be unavailable. They then got someone to essentially build me a new wheel. As for the wheels themselves? Well, do not buy the Team 30 Comp as build quality is awful. The Team 30 is €50 more and seems to be the far better buy. I can also whole-heartedly recommend Probike too. I am not going to say they are better than Wiggle or ChainReaction as all three provide an excellent service. I have now used the after-sales from each of them and have not had a single issue. Another thing: A lot of local bike shops get upset with online retailers. I can understand them, but the reality is that Wiggle et al are going nowhere. A local shop needs to change and evolve. Online brands know that they cannot offer the personal service of the local shop, so they bend over backwards on the after sales. If you want to survive, you cannot let a single client (or potential client) walk out of your shop with a bad taste in their mouth.